A leading water researcher outlined fresh approaches to India’s water problems and potential solutions at ICE WaRM-supported seminars in Adelaide and Sydney in June. At the Australia-Asia Water Centre in Adelaide, Associate Professor Ashu Jain examined the issues, challenges and possible solutions for water-related problems in India and Dr Rajib Maity outlined the value of studying hydroclimatology – research in hydrology and water resources based on information from large-scale climate circulation. 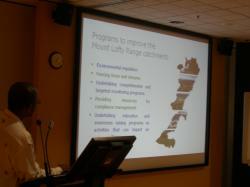 In Sydney, Associate Professor Jain presented an Indian perspective on water problems and solutions. To download Professor Ashu Jain’s presentation, please click here. To download Dr Rajib Maity’s presentation, please click here.